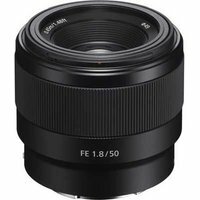 The Sony FE 50mm f1.8 lens with E-mount is designed for photographers and videographers looking for a fast, full-frame prime. Weighing in at less than 192g, this lightweight, high-performance lens features a new optical design and delivers all the benefits of a wide aperture prime lens: beautiful, crisp imagery with smooth, circular bokeh for the out-of-focus areas. For extended durability, the lens is built with a solid metal mount.